Out in Harmony sings for fun, not fame! No, really! We really do sing for the fun of it! And I’m saying that as someone who wasn’t so sure about that before I joined. Before moving to Vancouver, I’d wistfully longed to gather up enough nerve to inquire about singing in my local GLBT community choir. But, I had no singing experience, no idea how to read music (except what I might remember from my high school band days), and no idea how I would sound or if I could do that thing that choirs do – harmonize. Sure, the local choir’s website said that musical ability and experience were irrelevant, but did they really mean it? Really? Because they sure sounded like they all had musical ability at their concerts! Moving to Vancouver, I had two things on my side. First, I had the opportunity to chat a bit with the Out in Harmony director in a casual and friendly sort of way and had discovered that when they said non-auditioned choir that welcomes everyone regardless of musical ability, they actually meant it. Second, I was moving to a whole new city (and country) and if I didn’t put myself ‘out there’ to meet new people, I’d never make any friends! So, I made a pact with myself to give it a shot as soon as I moved here. I kept that promise to myself and attended my first rehearsal the first week I arrived in Vancouver. And, guess what? There really WAS no audition! I just jumped into a section I felt comfortable in and started singing. What I quickly discovered is so amazing about a “non-auditioned choir who welcomes everyone regardless of musical ability” is that we actually are motivated by the joy of singing together. What this does for the energy of the choir at every rehearsal and at every concert is something that is difficult to describe, but easy to fall in love with. It means that in spite of our diverse backgrounds as individual members, we all have at least one thing in common with one another: we like to sing. And that commonality is what makes this choir a fun place to be. Now, don’t get me wrong, we learn quite a bit while we’re having fun. Our director makes sure of that! Musically, the choir grows and learns each week. Part of what rehearsing is all about is improving our musical ability as a group and because we come from a variety of backgrounds and musical experience, each improvement makes us all so darn proud. There is just nothing that beats the feeling of accomplishment we gain from working with a piece of music from those first stumbling notes when we try to just learn the first page or so, to performing it at a concert when it’s polished up and sounds great. fun and joy in what you’re doing – the “ability” part evolves naturally over time. That is the magic in being a part of a group of people that makes music for fun, not fame! This is Out In Harmony’s secret to success and happiness. Tell everyone. In the fall of 1990 when this choir was founded, the choir’s vision and purpose was clear – to give gay people a place to be themselves, to sing together in a mixed-gender choir, and to do so while being highly visible. The name Vancouver Lesbian & Gay Choir was chosen specifically because it made it blatantly obvious at a glance that this was a group of women and men, who primarily identified as lesbian or gay, who sang together, -publically and proudly. Much of that is still true today. We are a mixed group of people who love to come together, blending our voices in song. We are people who know that everyone is different, everyone is unique, and everyone needs a place to belong where they can feel safe and free to be themselves. We are people who feel that it is very important to have a choir where everyone is welcome regardless of gender identity; of sexual, romantic or affective orientation; of musical ability or background; of physical ability, or of economic status. We are people who know that being Out is an ongoing process, and that there is still a need for a choir that stands up proudly saying ‘This is who we are. We are proud of who we are, & we are part of this community’. 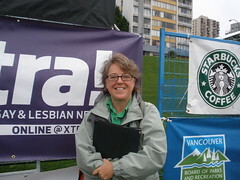 What we are NOT, is that we are NOT only limited to Lesbians and Gay men, and THAT was the impetus for the name change. We don’t want anyone to look at our name and think, “oh, that choir is only for lesbians and gays, & I wouldn’t be welcome there.” We truly strive to be a community choir, welcoming and encouraging everyone who understands the importance of, and wanting to be part of, a supportive and public singing group that actively identifies as ‘Non-Straight-&-Narrow’.